Chloe Marie. 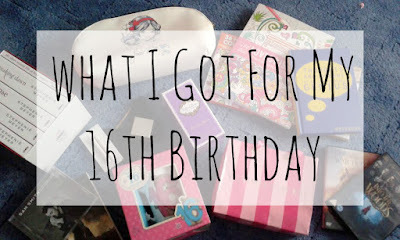 : What I Got For My 16th Birthday. 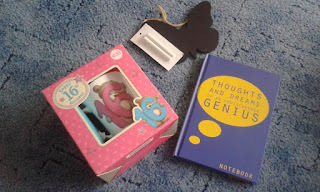 What I Got For My 16th Birthday. 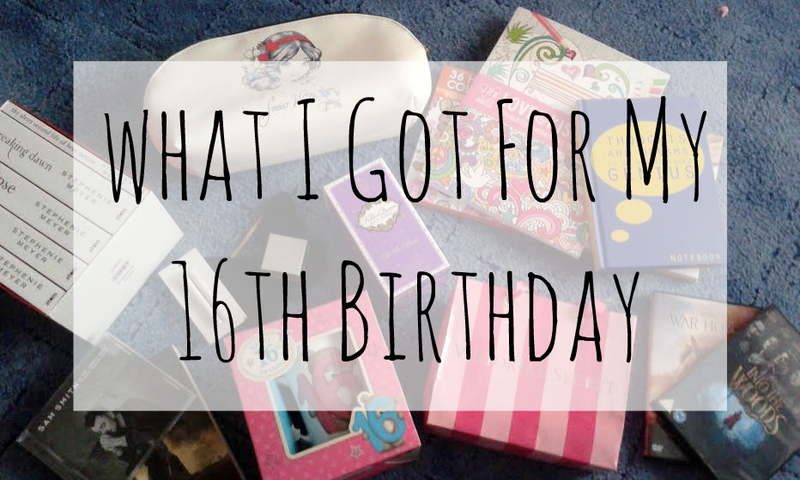 If you kept up with my Half Term Tales series or follow me on any form of social media, you'll know that on Monday February 22nd I turned 16! Yes the big 16 ladies and gentlemen. I had a great day but that's for another blog post coming very soon. Instead today I thought I'd do something that I did last year and that is a 'What I Got For My Birthday.' However, before we get into the blog post I have to do the whole disclaimer; I'm seriously not trying to show off in any way, shape or form - I was extremely spoilt this year for my birthday and am grateful for every single present, card or happy birthday Facebook post I got. Let's get started! What shall we go for first? Hmmm...let's go for the random bits and pieces I got. If anyone who bought me presents I would like to apologise because I did miss two presents off this picture which were a teddy and a box of chocolates, which I'm extremely grateful for. Anyway, the first random present that I received was a 16 mug, I probably won't be using this mug but rather using it as a keepsake along with the teddy bear it came with. Next up is part of one present which is a butterfly shaped chalkboard from one of my best friends, I think this is literally the cutest thing ever - I've just got to find somewhere to put it in my room. Lastly, I'm in love with the notebooks with the spines and cute quotes of the front, I don't know the official term for them but they haven't got the spiral wire holding the pages together. Anyway, I now own three after receiving this adorable notebook which says 'Thoughts And Dreams Of An Undiscovered Genius.' I'm excited to start writing in this one. Next up are DVD's and CD's. I have an ever growing collection of DVD's that are now almost overflowing from the shelf that they occupy and the same with CD's - I think I might be the only teenage who owns CD's anymore haha. Anyway, the first DVD I received was Into The Woods, I'm an absolute sucker for a Disney movie or musical so the aspect of a Disney musical was just perfection. I've probably watched the movie a million times before I got the DVD but I always love coming back to them so I like to have the physical copy. 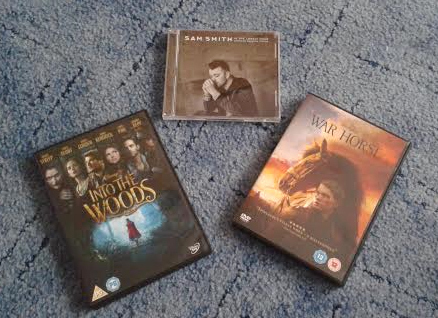 The other DVD I got was War Horse, I literally love the war - okay that didn't sound the same way in my head as it did on the page. I love learning about the war and war related things are a really interesting concept to me so this movie is perfect for me. Two interesting facts about War Horse - the first one is that I've got to see it on stage and it's one of my favourite things I've ever done, I want to go watch it again that's how much I loved it and secondly, my cousin is actually in the movie version of War Horse. He's not got a massive role, he's one of the army extras but he's still in it. Onto colouring now. Do you know those adult colouring books everyone's obsessed with? Well I finally joined the band wagon - extremely late I know - and I actually received two of these within a weeks period. One from my mum as a random present and the second for my birthday from my younger sister. 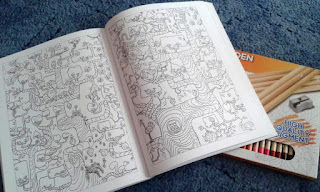 I love the designs in this book and can't wait to start colouring in it but I obviously need colouring pencils to colour these in which I also received from my sister - you can just see them in the background. We're onto what everyone really wants to see - the beauty part of my presents. This was one of the present groups I was most spoilt in as you can see from the picture below. First things first (getting my Iggy Azalea reference in there) is the most gorgeous pair of earrings I've ever worn. Seeing as I was born in February my birthstone is Amethyst and I've always loved the colour purple so my mum bought these simple stud earrings with a purple gem in the middle of the them - I've been wearing them non-stop and I literally love them! Next up is a present from my older sister - I love the Katy Perry fragrances and have almost ran out of the original Killer Queen scent which I love so when I opened a spin off from that collection, the Oh So Sweet Killer Queen Perfume, I was so happy. I haven't used it yet but when I do I'll make sure to report back to you on how much I love it. 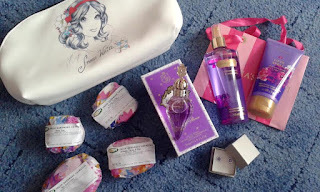 So my best friends know that I love beauty and have never had anything from Victoria Secret or Lush, I know - blasphemous! Anyway, so one of my best friends, who was out of the country for my birthday, bought me the Victoria Secret spray and body scrub in Love Spell. I've used the spray a couple of times and absolutely love it! I can't wait to use the body scrub - maybe a prom product there along with my other present from another best friend. I opened this huge Snow White travel wash bag - Snow White is my favourite Princess - and opened it to be greeted with the most beautiful scent ever; Lush. I got four Lush products which were the Rose Jam Bubbleroon, Tisty Tosty Bath Ballistic, Granny Takes A Dip Bubble Bar and The Comforter Bubble Bar Slice. They all smell absolutely amazing and I can't wait to use them in my baths. What other Lush products do you recommend? Last and certainly not least is the present that I have been MOST spoilt on. If you watched Britain's Got Talent two years ago you'll remember the winners Collabro. Now I didn't watch that series but when one of my best friends showed me a performance of theirs I became obsessed - I watched all their performances and have received both their albums, I also have them on Spotify so technically I have two copies of their albums haha. So me and her have a real obsession with them. When she gave me my present I was really confused because it was just a card so I thought she'd just gotten me money because I didn't know what I wanted. At lunchtime I sat in a packed music room because they were doing The Sound Of Music auditions for the Sixth Form Performing Arts Musical and opened my presents. I saved hers until last. So I opened the card and started getting emotional when I saw the front of the card which said 'You're The Star Of The Show.' 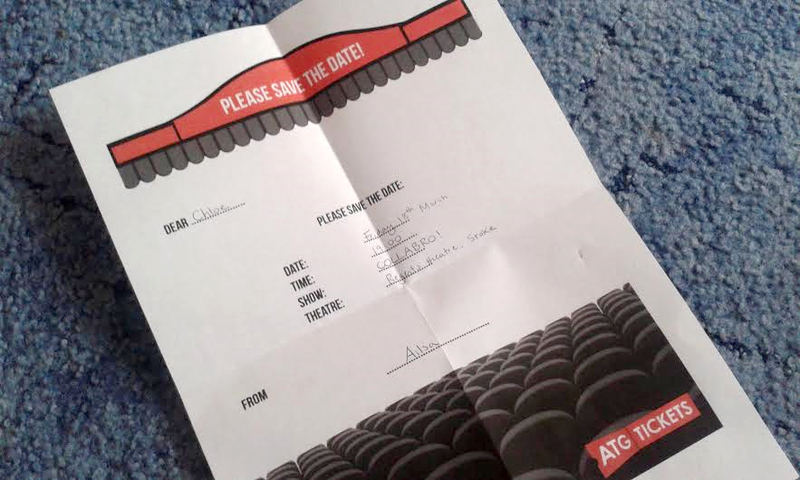 I had this sudden thing of she's bought me tickets for something so I opened the card and low and behold sat in their was a folded piece of paper. With extremely shaky hands I opened the piece of paper and lost it - in front of Sixth Formers, the Performing Arts teachers, all the Year 7's auditioning and my friends I started balling my eyes out, they all probably thought I was a bit mental until I explained why I was emotional. One of my best friends has bought me a ticket to go watch Collabro with her and her mum on March 18th. I'm literally so excited and that present is most definitely the best birthday present that I've ever received. 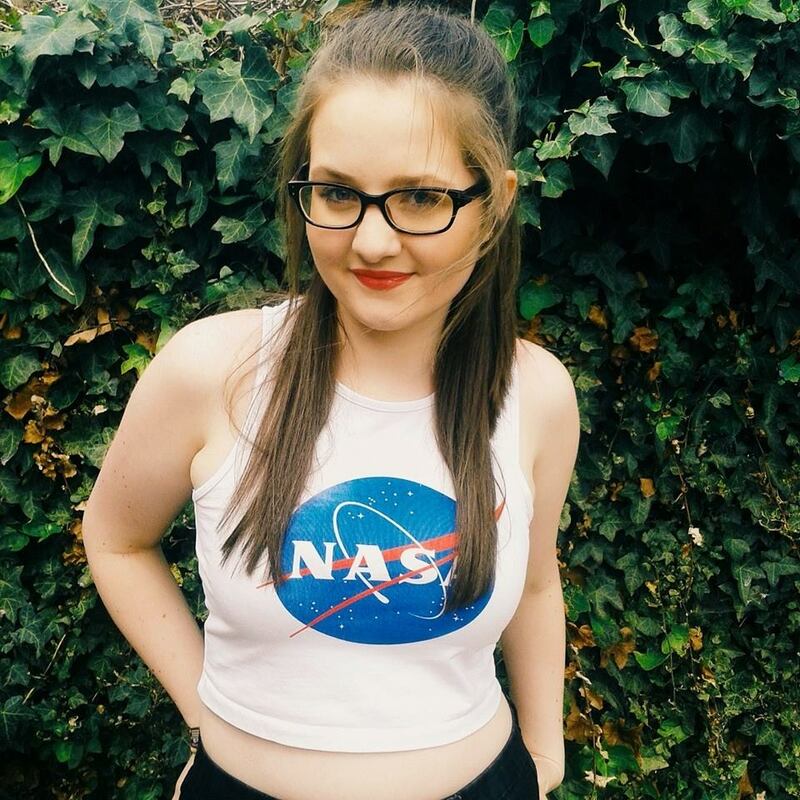 I know I could've just told you really quickly, but I want to be able to remember the story forever so I thought I'd write it here. So what I can gather from this round of birthday presents? I have the best friends ever and will love them forever. I hope you enjoyed this blog post as much as I enjoyed writing it. I'll see you on Wednesday for another birthday related blog post.